As it turns out, severalApple iPhone 8 and Apple iPhone 8 Plus users have complained about hearing static noise through the pair's earpiece during cellular phone calls. The crackling is not showing up when the call is heard over a headset, or if the speaker phone feature is in use. 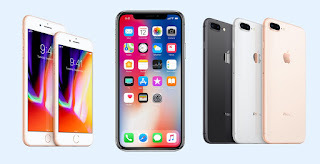 The noise can be heard when using FaceTime, which would seem to indicate that it is a software problem and is not an issue with one or more carriers. Apple has told those with the static noise to first factory reset their phone and use an iCloud backup to set it up. But this has produced hit and miss results. Even exchanging a static-filled iPhone 8 or iPhone 8 Plus for a replacement model hasn't done the trick either. The good news is that the company is looking into the problem and hopefully the company has news for us about this shortly. The noise is widespread, appearing with Wi-Fi calling and VoLTE enabled or disabled. If you are experiencing the same problem, you need to raise it with the company as they continue to look into a solution.